Listen to "Eye of the Needle" on your iOS and Android device. Reasonable summer read if you can overlook the Superman abilities of the main character. 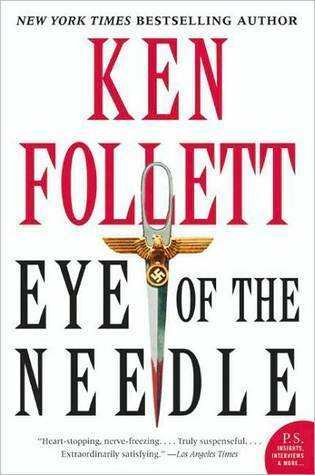 Ken Follett's Eye of the Needle is set in wartime England and Scotland. This is one of my favorite books, a suspenseful tour de force. It is well read with the exception of the odd American pronunciation such as "figewer" for figure ("figur" in British speak). In addition, coming from the British Isles, I am quite familiar with the regional accents and found this book sadly lacking in portrayal of the same. For Americans, unfamiliar with the Scottish and Yorkshire accents, the humor would be lost. I found myself chuckling at failed attempts to duplicate a Scottish or Yorkshire accent. This, in a way, ruined the authenticity of the story. Why, of why didn't the recording company choose a Briton to read and act out the character's voices in authentic accents of the British Isles. I would recommend Jim Dale, a master of accents and voices from Britain. Loved it! Listened to it on our trip to Denver from Chicago. Listened to it nonstop. Kept me riveted. *This Review Contains Spoilers* More of a stage play reading with a small cast doing all roles ensemble style, this audio book didn\'t quite capture the tension and suspense of the novel. Upon re-reading, it\'s a fast-paced thriller with the occasional clumsy dialogue, but the actors and their caricature dialects somehow make it worse. I\'d prefer a straight-up narration with an actor with some gravitas, but audio books have come a long way since this reading. If you\'re a fan of wartime British spy novels, Eye of the Needle is a good one, but it does feel dated in some ways. Can't claim to be totally objective, since I consider Follett one of the best popular authors out there. But I found "Eye of the Needle" to be a very satisfying audiobook. Follett engages you with a taut story-line, interesting characters and great scenery, which was well delivered by the narrator. I'm not entirely sure if I liked this book or not. It is a much different experience than any other that I have "read". It is the material that makes this book so unique. The author is exceptionally detailed and brings an ancient world to life... almost too much so. I think the reader does a good job with the material given and overall the book was good enough for me to go on to the next. A very good listening experience and a great story. Excellent intrigue and solid writing. I couldn't get into this book at all...I found the Narrator's voice so irritating and quick, the accents were awful...I couldn't stomach it through the first CD and had to send it back. It just didn't keep me interested at all.